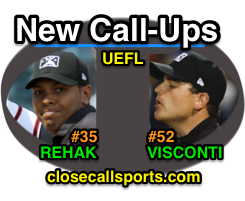 Major League Baseball added two umpires to its Minor League call-up roster, assigning Wendelstedt School alums Jeremie Rehak and Jansen Visconti, both of Triple-A's International League, sleeve numbers and placing the junior umps on MLB's fill-in list for the 2018 season. Rehak and Visconti effectively replace the departed Toby Basner (IL) and Clint Fagan (Pacific Coast League), who had served in the hybrid MiLB/MLB role for a combined 13 years. #35 Jeremie Rehak: After graduating from the Wendelstedt Umpire School in 2011, Rehak was assigned to the Gulf Coast League, earning promotions to the Appalachian, Florida Instructional, Midwest, California, Eastern, Arizona Instructional, and International Leagues. Rehak, who is 30 and resides in Pennsylvania, enters his 3rd season in Triple-A. His uniform number, #35, was last worn by the late Wally Bell, who passed away during the 2013 postseason. #52 Jansen Visconti: Another 30-year-old from Pennsylvania (both Rehak and Visconti are from Westmoreland County, PA) who graduated from Wendelstedt's, Visconti earned a spot on the Gulf Coast League roster in 2010, subsequently officiating the New York-Penn, Florida Instructional, South Atlantic, Carolina, Arizona Instructional, Eastern, and International Leagues; 2018 will be Visconti's 4th full year at the Triple-A level. His assigned number, #52, was last worn by Bill Welke, who traded in #52 for brother Tim Welke's #3 following Tim's 2016 retirement. The 2018 Umpire Roster & Crews page has been adjusted accordingly.